Norman Rockwell took me on a trip through American political and cultural history earlier this week. The North Carolina Museum of Art exhibit, American Chronicles: The Art of Norman Rockwell, includes 47 years of his covers for The Saturday Evening Post plus dozens of other paintings. I first got a deep look at Rockwell almost ten years ago when the Corcoran Gallery of Art presented Norman Rockwell: Pictures for the American People. Until then I thought Rockwell was an early version of Thomas Kinkade, not deserving of art world respect, but since I happened to be at the Corcoran I thought I’d take a quick spin through the exhibition. Cue the comeuppance. I was introduced to a man with great talent and insight who in one painting portrayed the private moments of the girl next door and in the next the televised moments of one thrust onto the world stage. As I browsed through his Evening Post covers I wondered, who is his counterpart today? Whose work attracts a comparable audience? Whose work touches on politics, current events, pop culture and common experiences? We have personalities like Andy Rooney, Jon Stewart and Jay Leno. Are they modern day Rockwells? I don’t think so. Who would you nominate? I laughed when I saw Deadline (Artist Facing Blank Canvas) . Here’s a guy who had a creative block and used that as a subject for his next cover. Brilliant! What writer or blogger can’t relate to a looming deadline and blank document? 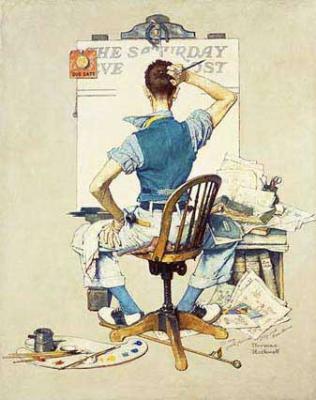 Rockwell’s art has always been pooh-poohed as lightweight. While he was selling his illustrations to magazines and advertisers, the art world was fawning over Pollock, de Kooning and Warhol. Some of Rockwell’s work was sentimental and sicky sweet, but it captured a common vision of America, a Jimmy Stewart version, an idyllic childhood that everyone remembered, imagined or wished they had. 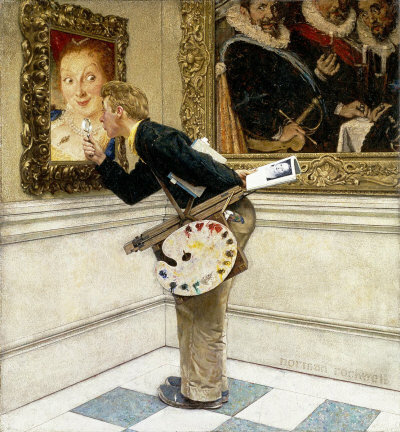 Rockwell had his own fun with the sneering art critics and connoisseurs of his day. Look how the lady in the painting flirts with the critic and how the three Dutch merchants in the adjacent painting react. Say what you will, the man had skills and depth. He butted up against the prevailing standards for portraying a white bread world. He didn’t just paint happy scenes of Americana but also grappled with the dark side of our country’s past: a young rich white boy in a dining car trying to figure out how to tip the grandfatherly black waiter; a black girl walking into her newly desegregated school surrounded by the legs of her accompanying federal marshals; and the red blood stains on a bleached white shirt of a murdered civil rights worker in Mississippi. Art provides many types of experiences to viewers. Sometimes the sensory experience is enough. But usually art stirs up other emotions and thoughts and that’s when the experience gets interesting. Like my last visit to a Rockwell exhibition, this one was an unexpected delight. I got more of a sense for the man and he surprised me. I also got a stroll through 20th century America. The exhibit whetted my appetite to learn more. I guess once a history major, always a history geek. I have a new imaginary book for my fantasy library: a catalog of all of Rockwell’s Evening Post and Look magazine covers, one piece per page and each accompanied by an essay that puts it in historical and cultural context. That would be the ultimate American chronicle for a rainy day like today.